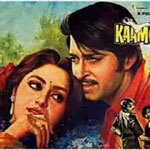 "Kaamchor" is a 1982 hindi film which has Jaya Prada, Asrani, Tanuja, Neeta Mehta, Suresh Oberoi, Shreeram Lagoo, Bhagwan, Pinchoo Kapoor, Sujit Kumar, Rakesh Roshan and Sonu Nigam in lead roles. We have and one song lyrics of Kaamchor. Rajesh Roshan has composed its music. Alka Yagnik, Kishore Kumar and Chandru Atma have sung these songs while Indeevar has penned its lyrics.